I am so excited for Valentine’s Day! I love the decor. I love the love. 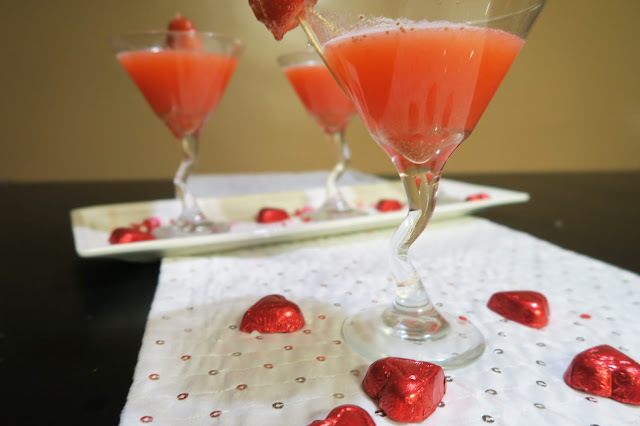 I love the Valentine’s Day themed drinks and treats. Because Hubs and I can’t always afford to get a babysitter, many of our special holidays are spent with an in-home date. In-home dates can be just as special as going out if you put in effort to make things nice. You can make a favorite meal, or order delivery with something special. Take the food out of containers and serve it on nice plates at a candlelit table. You can make a special Valentine’s Day themed drink. 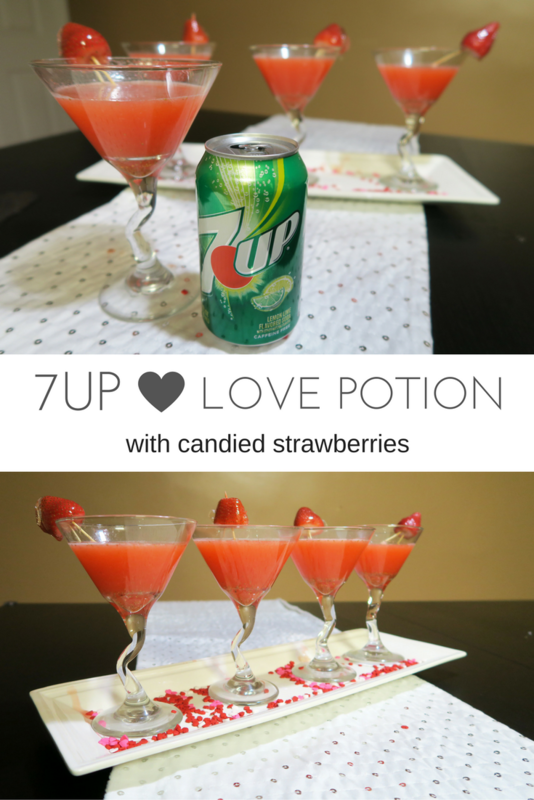 Today I’m sharing my recipe for a simple 7UP Love Potion with candied strawberries. The strawberries these are garnished with are like candy apples, but better, because you get the sweet, crunch, and softness all in one bite every time! Clean and cut the tops off your strawberries and add them to your blender. Pulse just your strawberries until they are pretty well pureed. Add the 7UP and lemonade. 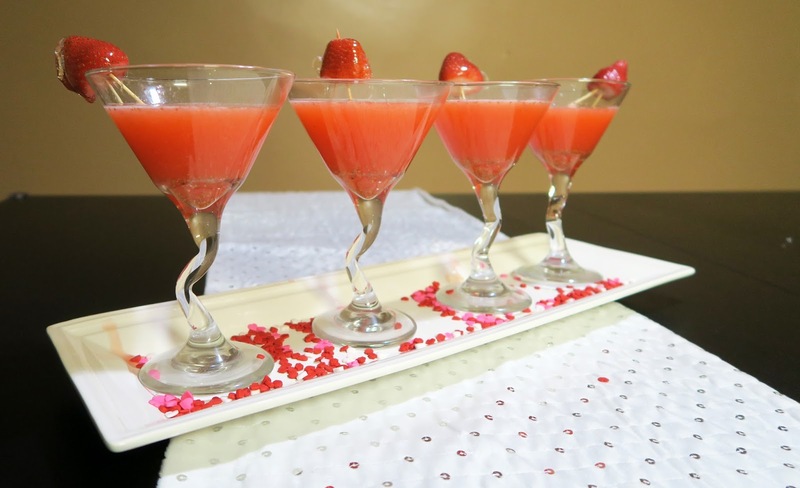 Continue to blend until you have a smooth liquid with very little strawberry solids. At this point, if you have made your drink ahead of time you can chill it in the fridge. If you are in a rush you can shake your Love Potion in a martini shaker with ice to chill it. Serve in martini glasses. This recipe makes four servings. While it only takes one can of 7UP to yield four servings, if you plan on entertaining you can pick up the 7UP 12oz. 12-pack from Walmart like I did so you have plenty of 7UP on hand. 7UP is really versatile when it comes to adding a pop to drinks and cocktails. *If you want to kick it up a notch, add 6 ounces of vodka along with the 7UP and lemonade. Rinse and cut the tops off your strawberries. Dry them thoroughly. Pierce each one with a toothpick. Line a baking sheet or plate with parchment paper. Mix the sugar, water, and corn syrup in a small saucepan. 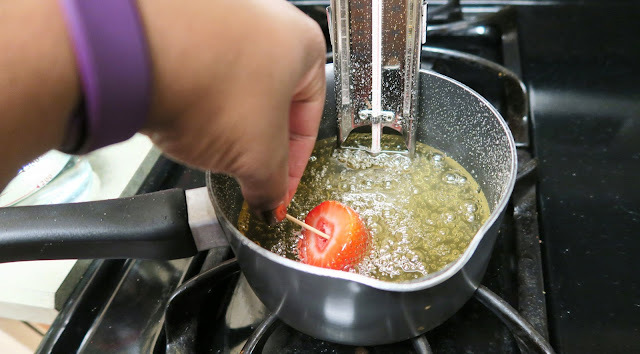 Heat on medium-high until it reaches 300 degrees on a candy thermometer. Stir occasionally until all the sugar is dissolved. This took about 25 minutes for me. Once the mixture is at 300 degrees remove from heat and dip your strawberries as quickly and safely as you can. Dip as many strawberries as you can before the mixture seizes up on you. At a good pace you should be able to get 15 - 20 strawberries dipped. 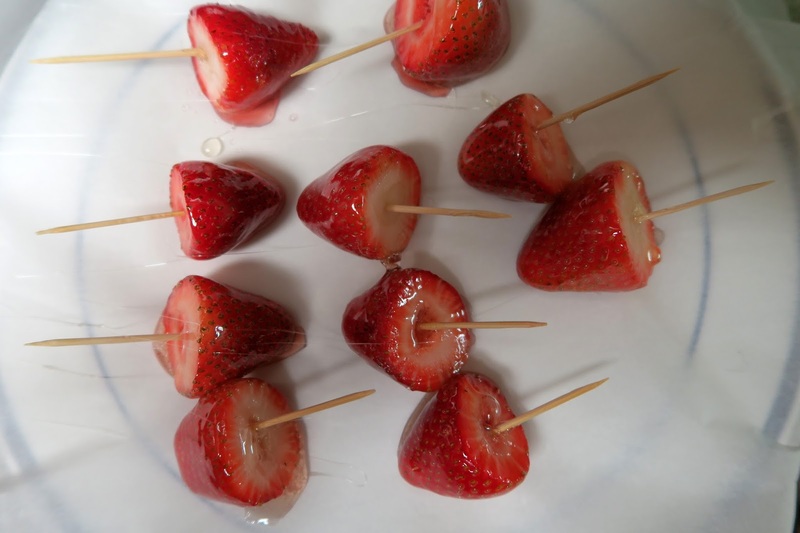 Allow the strawberries to dry and harden on the parchment paper. To garnish your 7UP Love Potion with the strawberries add an additional toothpick to each to balance on the rim of the martini glasses. Both of these recipes are super simple and all the ingredients can be picked up at your local Walmart. 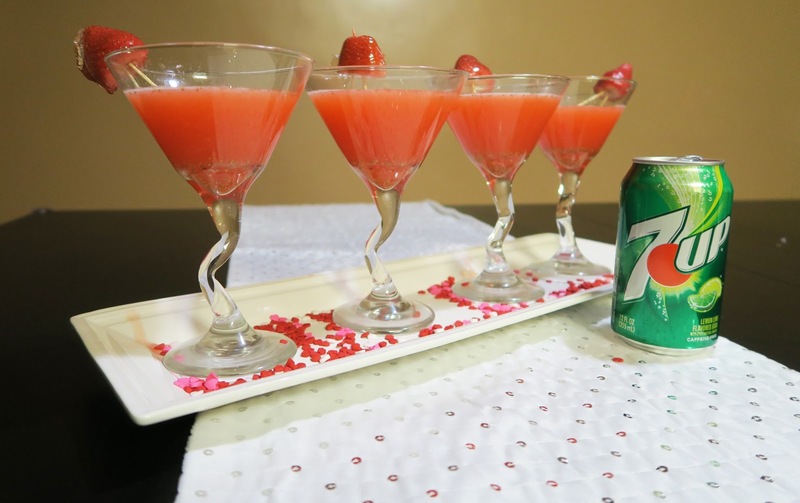 Make your Valentine’s Day festivities special with this 7UP Love Potion! Oh my gosh, stopppp, this looks amazing. I want candied strawberries, like, immediately, just... as a snack. That's totally healthy, riiiight?